Adventures in the Endless Pursuit of Entertainment: The Event of the Season! We bought our tickets for this concert in August of 2005. After months of enduring the anticipation, finally the night arrived! 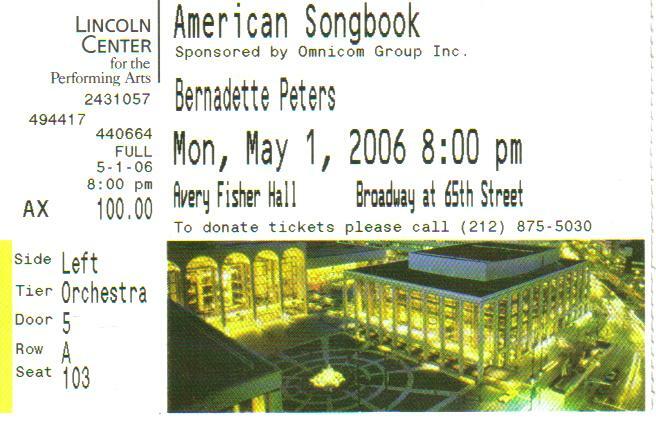 Bernadette wore a new shimmering Bob Mackie gown and looked spectacular (when doesn't she?). From my first row seat, it seemed as if she was singing just to me. She told me later that she saw me on the front row. She threw in "Shenadoah", accompanied only by harmonica - the sound of her voice resonated through Avery Fisher Hall and gave me chills. She said she had wanted to sing it for a long time. She also thrilled with all of her signature Sondheim pieces - "No One Is Alone", "You Could Drive a Person Crazy", "With So Little To Be Sure Of", "Children Will Listen", "Being Alive", "Move On" and "Rose's Turn". It was good to hear her include some of these songs again which are so very emotionally heart-wrenching. She sang for almost two hours without intermission - she was in as fine of voice as I've heard her and of course, she's the consummate performer. The audience cheered her with thunderous applause at every opportunity. This is what Stephen Holden at the New York Times thought. It was an especially fun weekend because Fanadettes arrived from near and far for the event. We spent the weekend seeing shows - Noah and I saw [title of show] (loved it)and Grey Gardens (loved it) off-Broadway, and of course, there was the sublime Audra McDonald at Carnegie Hall on Saturday night. Our fellow Fanadettes saw Sweeney Todd (raves), The Drowsey Chaperone (raves), Three Penny Opera (semi-rave), Defiance (semi-rave) and Three Days of Rain (a pan). On Sunday, 12 of us gathered at the Museum of Television and Radio for a screening of Bernadette's 1954 and 1978 appearances on Name that Tune (she was 5 years old) and The Muppet Show (she was 30 years old), respectively - these are required viewing for any self-respecting Fanadette. The striking thing is that even though there was a 25 year time span, she really didn't look any different - just bigger - that's pretty much the same today! We then had a great dinner at Tony's Di Napoli, a tour of the Lincoln Center Plaza and the lobby of Avery Fisher Hall (where we heard the orchestra rehearsing "Rose's Turn") and then Karen, Vicki and I rounded out the evening with a visit to Malachi's Pub. It was my idea of a perfect weekend!